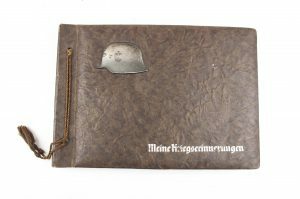 Unique shrapneldamaged soldbuch to Panzerschützen Franz Schefler, born 11 december 1926 and enlisted on 11 august 1944 at the age of 17. A typical 17 year old aryan boy with blond hair and blue eyes. He enlisted in 2. Kompanie Panzer Ersatz und Ausbildungs Abteilung 10, transferred to Panzer Ersatz und Ausbildungs Abteilung 4 and later to Grenadier Regiment 912. He was awarded the Verwundeten Abzeichen Im Schwarz on 7 november 1944 due to wounds noted as Krankheit 31B which indicates 31b-Handgrenade, mortar, artillery (shrapnel). Grenadier Regiment 912 fought heavily in eastern Prussia or Ostpreussen and was destroyed first of april 1945 at Heiligenbeil which is currently known as Kaliningrad. This is for sure one of the most visual and poignant pieces of history I’ve had to offer. 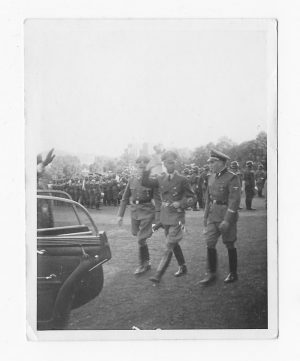 A nice original picture of Reichskommissar in der Niederlande Arthur Seyss-Inquart and Generalkommissar für das Sicherheitswesen Hanns Albin Rauter. Size 6,5 x 9 cm. 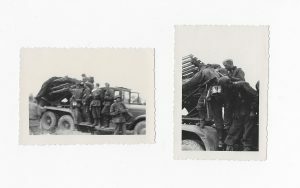 A nice set of two original Waffen-SS pictures of SS Totenkopf EM, NCO and a officer inspecting a Katyusha rocket launcher. A nice set of three original pictures showing the Circle of Life. 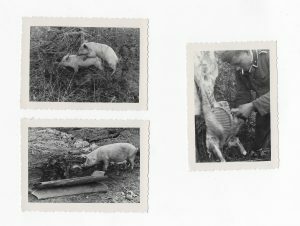 The third picture shows the boar being cut by a SS-Unterscharführer. 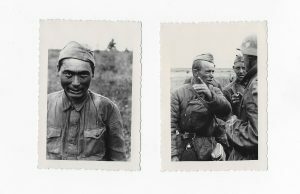 A nice set of two original pictures showing Russian POW’s. 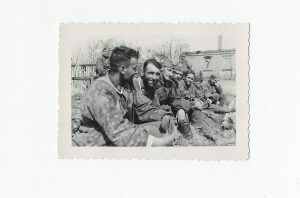 A nice original private SS Totenkopf Picture showing a few NCO’s in camouflage clothing. 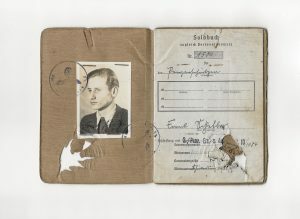 Stunnning photograph and document grouping to Gefreiter Erwin Forkel, 2. Kompanie Fallschirmjäger Artillerie Regiment 1 which is a part of the first Fallschirmjäger-Division. Forkel jumped onto the island of Crete and survived the landing and fierce battles following after. He was assigned with the Fallschirmjäger Artillerie Regiment 1 equipped with the recoilless 7.5 cm Leichtgeschütz 40. 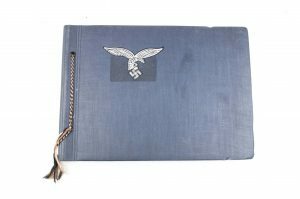 The grouping consists of a number of signed documents, awards and a stunning and highly impressive photo album with over 240 pictures on the Crete campaign. 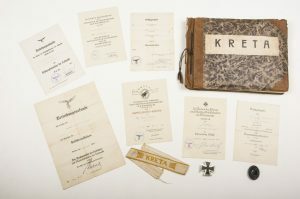 The documents are all named to Erwin Forkel and signed by several high ranking and famous members of staff such as Geudens, General der Fallschirmtruppe Richard Heidrich and Generalleutnant Sponheimer (21.ID). The documents are both hand signed, manuscript and facsimile. The documents are for the Sturmabzeichen, Verwundetenabzeichen, Eiserne Kreuz 1. Klasse, Ostmedaille, Ärmelband Kreta, Fallschirmschützen Abzeichen and Erdkampfabzeichen der Luftwaffe. The documents come with Forkels original wound badge, EK1 and Kreta cuff title. Erwin Forkel was a highly decorated Fallschirmjäger! The photo album is like the document grouping highly impressive. There are over 240 pictures, maps and postcards bound in a thick beaten and battered album that must have travelled with him a lot. The front of the album has the big title KRETA and is loose from the album(!). The album focusses a few pictures on barracks and jump training soon to move to Crete. The Crete invasion is well documented in the album, from the loading of planes to the jumping itself and the following battles. There are many non published pictures that show the combat conditions they where in. Many pictures show destroyed British tanks, dead British soldiers and fully equipped Fallschirmjäger in trenches with equipment and weapons. The grouping would be a centrepiece in any Fallschirmjäger collection, especially for those who collect the early war items. The album speaks for itself and is even way more impressive in hand. A stunning grouping to one man that for sure that would be very, very hard to upgrade! 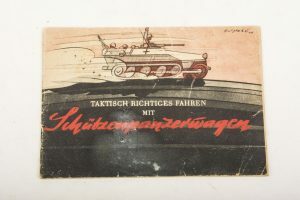 A stunning original manual by Guderian on the tactical movement and usage of the German armored personnel halftracks or Schützenpanzerwagen. 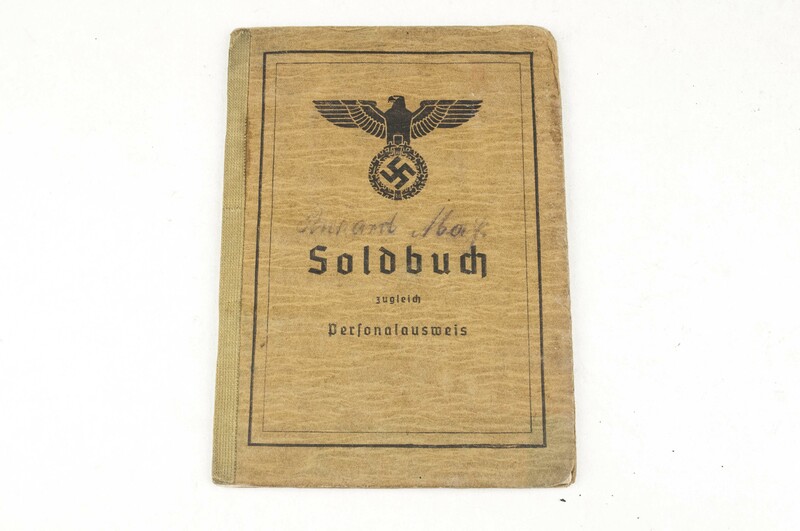 A very rare manual that was printed in 1944 and distributed to Panzergrenadier units. These manuals where mostly kept in vehicles and are therefor very scarce to find. The manual is in very good condition and is very hard to find! Nice original Waffen-SS poster sized 66 x 55.9 cm. This poster is in very good, original condition and would make a great backdrop to any Waffen-SS collection. 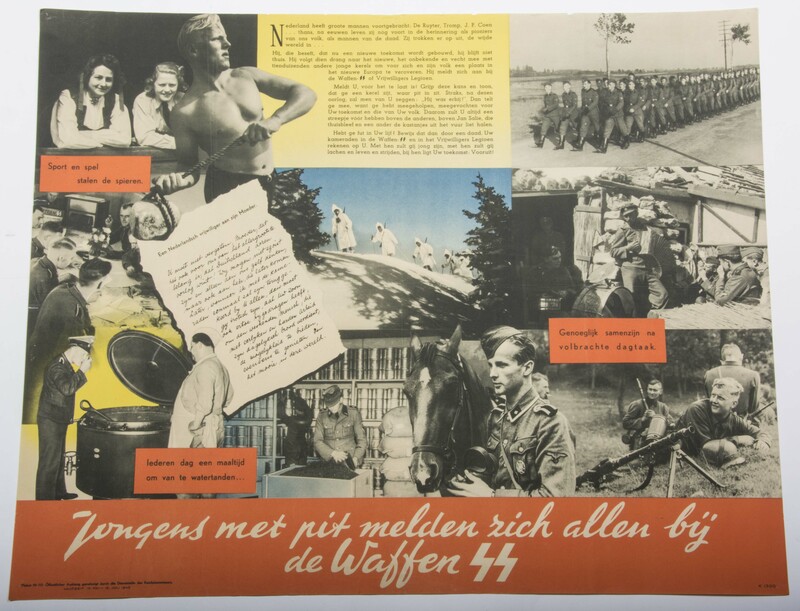 The text urges strong and tough Dutchmen to enlist in the Waffen-SS. The poster is in very good condition as you can see on the pictures. 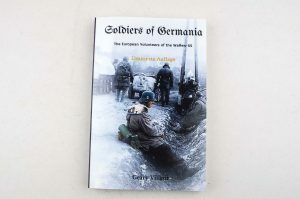 The Soldbuch opens at 14-3-1945 with Grenadier Ersatz und Ausbildungs Battalion 191. After this basic trainings he became part of the Stabskompanie of Panzergrenadier Regiment 1314 of the 156. Feldausbildungs Division. 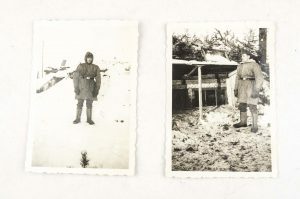 A set of two original pictures of the same man wearing the first model Charkov Parka in the Russian winter of 1941/1942. The pictures are nicely marked Rußland 1941/1942 on the back. A nice set of photos with the first model Charkov parka and a modified Heer M42 Schiffchen with a added skull. Standard padded envelope shipping is included in the price, if you want tracking with your order simply select it upon checkout! A only scarcely encountered complete set of J. Vincx & V. Schotanius’s – Nederlandse Vrijwilligers in Europese Krijgsdienst. One can find part one to three, but part four is extremely hard to find and contains many pictures and information regarding the Wiking division. The books are in very good condition without damages complete with the original paper backs. 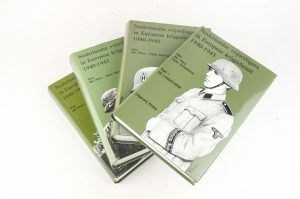 A scarce opportunity to buy the whole set, a great documentation on Dutch volunteers in the Waffen-SS! They called themselves the “assault generation” and they had largely been born in the years during and after World War I. Coming from every nation of Europe, they had risen up against communism and banded together under one flag for a common cause. They joined the German Army in World War II, a volunteer army that was better known as the Waffen SS. And it was in the Waffen SS, the elite fighting force of Germany, where the first modern European army was born. A new society of front fighters emerged from many different European nations; it was a society that had been forged in the sacrifice, sweat, and blood on the battlefield. Maybe their heritage and culture was different but their uniforms and motto were one and the same: Meine Ehre Heisst Treue! A interesting book with many stories by various veteran accounts. Only 100 of these where printed! Free shipping! A nice original pre/early war photo album belonging to a soldier in the Heer. The album consists of many training pictures and a few pictures of the French countryside and all sorts of sights in Paris. The album consists of many interesting picture with early or obsolete equipment such as the MG 08/15, reissued M16 helmets and the prewar Jackboots. A nice album with many interesting pictures worthy of a further research!